Power management specialist TE Connectivity (NYSE:TEL) will pay a third-quarter dividend of $0.25 per share, a 19% increase over the $0.21-per-share payout made last quarter, the company announced yesterday. The board of directors said the quarterly dividend is payable on June 14 to the holders of record at the close of business on May 31. 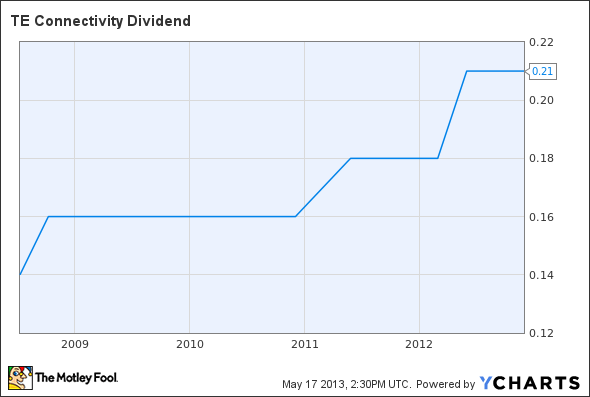 TE Connectivity has paid a dividend every quarter since 2008 from when it used to be known as Tyco Electronics. The regular dividend payment equates to a $1.00-per-share annual dividend yielding 2.2% based on the closing price of TE Connectivity's stock on May 16. TEL Dividend data by YCharts. Is It Time to Buy TE Connectivity Stock?